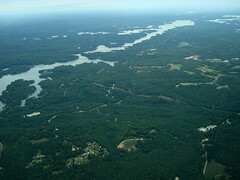 lake keowee (Photo credit: zen) Still keeping our exact location a secret, but it’s in this general vicinity. The Zombie Emergency Response Organization (ZERO) is proud to announce we’re opening a second sanctuary for zombie children in beautiful upstate South Carolina. Though the majority of our residents are from New England and Canada, there are an increasing number of referrals from Florida, Georgia, North and South Carolina. Part of our mission includes keeping the families of these children, when we can identify them, involved in their child’s life. Our New England location, convenient to several major interstates, is convenient for northern families and facilitates their ability to visit and spend time with their zombie kids. Unfortunately the rising cost of airfare and gas has robbed many southern families of the means to visit their children more than once or twice a year. We’ve tried to fill the need with chartered buses and allowing families to travel by our Underground Railroad system, but these methods proved to be too much of a security risk and we’ve had to discontinue them. When we surveyed the country to see what resources were available to zombie children we found that the West Coast zombie children have been embraced by Scientology. The Southwest protects their zombies on Indian Reservations. The Midwest, Alaska, and Hawaii steadfastly maintain they have no zombie children within their border. The only area without a zombie plan is the South. This information led to our decision to open a new sanctuary on Lake Keowee in South Carolina to accommodate zombie children from Southern states. 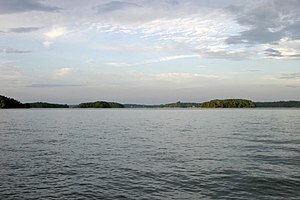 Lake Keowee, a manmade lake constructed by Duke Energy, offers several large islands as well as secluded, non-developed coves that are capable of keeping our children physically segregated and secure. The temperate weather will save our organization the high cost of New England fuel. The low taxes will free up money for additional staff members and plant improvements. The famed hospitality of South Carolinian‘s will prevent the occasional stand-off that takes place in New Hampshire between local residents and lost family members. Our initial plans include a fifty-bed housing unit as well as ten lakeside cabins for visiting family. We’ve already received our permits and are putting up fences and pouring concrete. Our projected opening date is September 2013 and we’ll be accepting applications and referrals starting June 13, 2013. Remember, we feed the zombie kids so you won’t have to.